Focal Pointe Design, LLC is a 3rd generation industry owned by professional designer Frank B. Pirrello. My grandfather Pirrello’s first shop was in Detroit and my father was a custom cabinet maker with a business originally located at Chalmers and E. Warren. We presently operate a woodworking fabrication facility on East Eight Mile Road in Warren and specialize in the Grosse Pointes. Our showroom is located on Mack Ave. This is a family business and this community is our home. Kitchen and bath companies have come and gone…but our family has been in this business for many years and we’re here to stay. 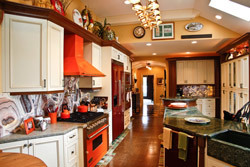 We know how many Grosse Pointe kitchens and baths are short on space. If there’s a wall, we can move it, we will find the extra inches, and stretch them. Kitchens can be outfitted with freezer drawers, warming drawers, under counter wine chillers, not to mention the latest in built in appliances. These all add to the efficiency of the modern kitchen. As for baths, they weren’t designed 40 years ago to be used the way we want to use them today. Now you can have double bowl sinks, skylights, and multiple-spray showers. We can create storage where you thought you had none – you’ll get maximum capacity out of minimal space. Focal Pointe is a design firm with distinctive flair for the extraordinary, with decades of construction and remodeling experience.